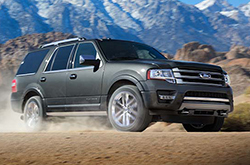 The always reliable Ford Expedition only receives slight updates for the 2016 model year. The truck-based utility vehicle, which has held a place in Ford's lineup since 1996, continues to be one of the top SUVs on the market for buyers in need of a vehicle with excellent towing capabilities, ample passenger room and exceptional cargo space for hauling items. Adding to the Expedition's list of benefits this year is the inclusion of SYNC 3 technology, which replaces MyFord Touch. You can learn about the new system and other details about the latest Expedition model in our 2016 Ford Expedition review below. If you pick up a 2016 Ford Expedition in the Phoenix area, the only change made to the SUV over last year is the addition of SYNC 3 technology. The all-new system takes the spot of MyFord Touch and delivers a much more satisfying user experience. Equipped with brand-new software, the system is more intuitive, responsive and faster than the outgoing MyFord Touch interface. It allows drivers to easily stay connected while traveling and comes with an array of innovative features, including hands-free calling, 911 Assist, music search and control, SYNC AppLink, available navigation and Siri Seamless Integration. Generating 365 horsepower and 420 lb.-ft. of torque, a turbocharged 3.5L V6 is the sole engine option on the 2016 Ford Expedition in Peoria. It comes standard with a six-speed automatic transmission and can be fitted to either rear-wheel- or four-wheel-drive models. When equipped with rear-wheel drive, the crossover can deliver an EPA-estimated 22 mpg highway, while four-wheel-drive models produce an EPA-estimated 20 mpg highway. Additionally, the Expedition can tow up to 9,200 pounds when properly equipped and can take off from 0 to 60 mph in a quick 6.5 seconds. To acquire further information about the latest Expedition and its range of amenities, keep reading our 2016 Ford Expedition review. 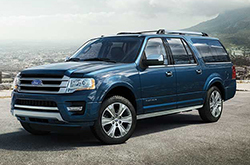 Also please call and schedule an appointment to come test drive the new Expedition at Peoria Ford! The 2016 Dodge Durango, Toyota Sequoia, Buick Enclave and the Chevrolet Tahoe are outmatched by the 2016 Expedition in several areas. If the Expedition's convenient onboard technologies and handsome looks don't convince you that it's the perfect vehicle for you, we're sure its inexpensive sticker price will. When compared to the aforestated list of vehicles, in terms of price it's clearly a remarkable value, making it a first choice among Ford customers in Peoria. View our bullets for more useful facts! Welcome to the Peoria Ford review of the new Expedition. 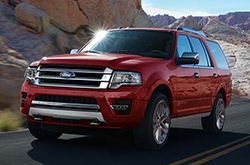 After reading our overview above, if you decide the Expedition isn't the perfect vehicle for your lifestyle, please check out other 2016 Ford reviews in our research gallery. We take our responsibility to provide the best reviews transcribed by automotive experts - it's just one more thing that makes us a well&$45;respected Ford franchise in Peoria. Each paragraph is stuffed with usable facts, including info about powertrain options and more - everything you need to make an good purchasing decision. Not sure if the Expedition? is a fit for you? Check out our online research directory to read more Ford reviews and to compare Peoria Ford's models to vehicles from other manufacturers.